Few people would visit the Commonwealth of Dominica for business reasons. The small island is relatively untouched, with mostly waterfalls and national parks to attract nature lovers and hikers. Unfortunately, when negotiations require you to spend all of your time in Roseau, its tiny capital, you miss out on all of that. You do, however, get a good idea of what Roseau Dominica is really like. After a weekend playing in Calibishie, it was time to get down to business. Dan and his business partner had meetings scheduled in Roseau for the next five days, so we wives were pretty much “stuck” there for the duration. Sure, I could have taken a few day trips on my own, but that's not the way I roll. I like sharing new discoveries with Dan; he's my beast friend as well as my husband. And besides, abandoning Richard's wife and toddler seemed heartless, to say the least. Likewise, I couldn't in all good conscience abandon my poor son Chris, who was stuck in our hotel room with a week's worth of school work. How to survive for a week in Roseau? 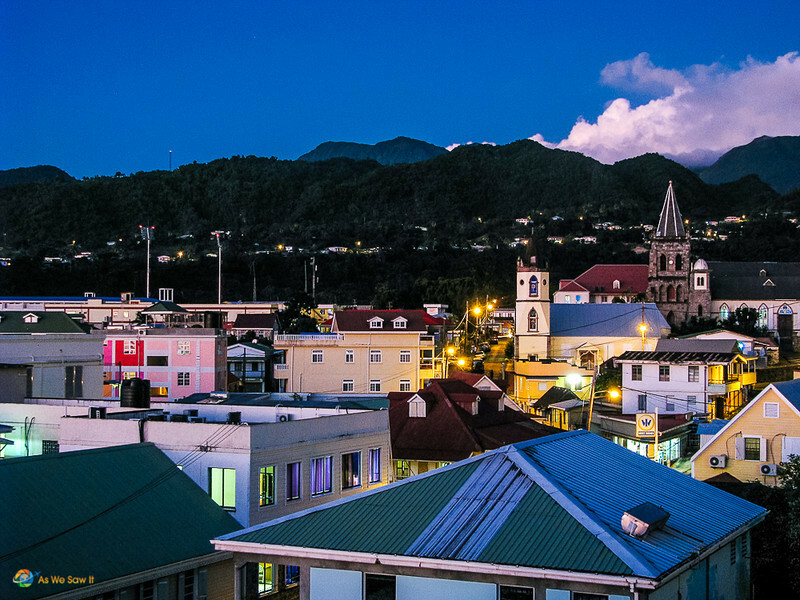 Although it's Dominica's capital and its largest city, Roseau is only about maybe 10 blocks wide and deep, so it's easy to navigate. Tucked on a narrow strip of land between sea and mountain, it's a quaint town so obviously different from America that while we were there we almost forgot that we were still in the same hemisphere. Due to the heat, many Roseau residents spend their days outside in the shade, chatting to each other or selling their wares to passersby. True, a very few of the shops were air conditioned, but most of them were stifling. No one seemed to mind having only one or two fans. Except for us. We weren't used to the climate and started looking for fans everywhere we went. When we found one we lingered in front of it for as long as possible, marveling at how the locals never seemed to break a sweat. Dominica's top hotel is the Fort Young Hotel, so named because one wing was actually a fort at one time. For history buffs, their Fort Rooms are housed in part of the original fort buildings. I would have liked to stay there, but I was overruled. We stayed across the street in the Garraway Hotel, which was reputed to be the best hotel for businessmen. It was not quite as posh as the Fort Young but it was comfortable … and a whole lot more affordable. The staff were attentive, we had air con and our room had fabulous views of the bay front and the city. Not to mention a rooftop to view the luminous sunsets. In retrospect, although the Garraway may be a good choice for businessmen and tourists who take day trips into the cooler mountains, it was not the best choice for us. We were there in the stifling heat all day. If we had known that our hotel didn't have a pool, we would have literally begged our husbands to spring for rooms at the Fort Young. Price be damned. 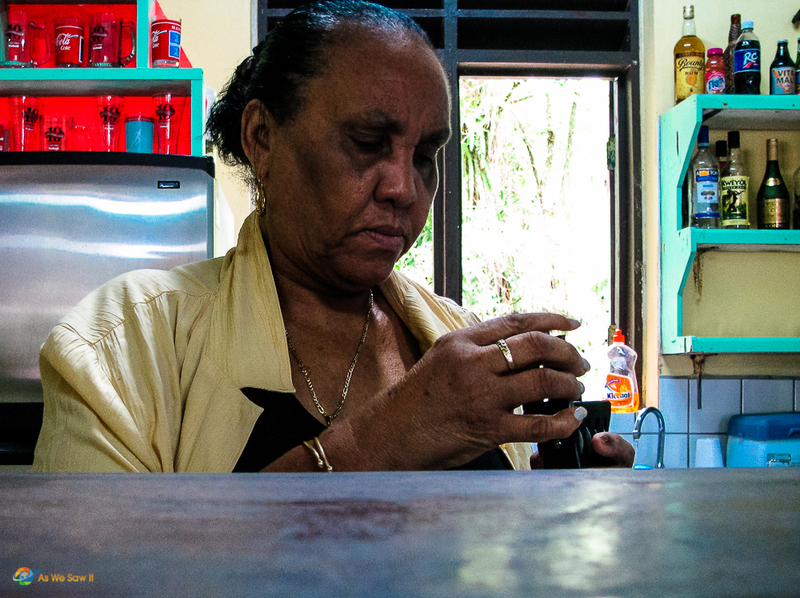 Every morning we would meet for breakfast and savor the island's coffee before taking the little guy for a walk around town. It was our time to explore the town and its many shops. And shopping and walking were about all that we could do, for the city had only one small history museum and no easy access to the beautiful Caribbean waters. On our first day in town we discovered a simple stand only a few blocks from our door where a very friendly man made yummy smoothies from fresh fruit … so every morning our first priority was to walk over and see if he had opened for business for the day. For EC$5 (about $2.80) his blender would whip up a refreshing drink for us, using only the island's fresh fruit and some ice. We almost always bought one and took it on our walks. Tip: You'll find his fruit smoothie stand is only a block away from where the cruise ship docks. Though you can't see it, the burned-out building behind Smoothie Man is actually a nightlife spot. Let me tell you: Navigating a stroller through Roseau is quite a workout! Few streets had good sidewalks and some had no sidewalks at all. Still, it was easier to wheel him around than to carry him everywhere, especially in that oppressive heat. The little guy never let the temperature get him down, though. He made many friends for us with his sunny disposition and winning smile. Dominicans are really friendly and although we were of a different color, they never made us feel different. On the bright side, I'm told that walking in hot weather burns more calories. Smoothie or no, by lunchtime we'd be dripping wet with sweat from the heat and exercise, hungry, and ready to return to the hotel for a shower and the air-conditioned comfort of our rooms. Our biggest disappointment of the entire trip was that the Garraway Hotel had no pool; we really could have used it. Tip: If you're going to a Caribbean island – no matter which one – make absolutely sure you will have access to either a pool or the beach. Must. Cool. Off. Kids need an afternoon nap so I spent my afternoon hours on my own, wandering the streets with my camera and smoothie #2, talking to locals and walking through the streets. I found some interesting churches and buildings along the way, and a really impressive stadium. We discovered that the most expensive stores are right on the bay front, within view of every passenger as the cruise ship docks. They carry all the usual touristy things, from jewelry to clothing to overpriced, tacky souvenirs made in China. The most amusing souvenir I saw, however, was the Obama rum. Most of those seafront shops are owned by the cruise companies and contribute little to Dominica's economy. Far better deals can be found on the side streets, where tents will pop up when a ship is in port. This is where to shop: Many of those products are handmade and brought into the city for the day. Shoppers might want to skip the Duty Free Emporium and ask how to get to Astaphan's. It's the largest store in Roseau, a modern shop with a variety of Caribbean products. It's only a few blocks away and far more interesting. Or just wander the streets and find a random local shop or two. Tip: If you're looking for products made in Dominica, I highly recommend Bello hot sauces, Bay Rum and coffee. All are produced on the island. Buy them at a local grocery store to save money and help the economy more. Roseau is small enough that most of it can be seen in one day, so by the end of the week our daily routine got really old. We were thrilled when Friday rolled around and the men didn't have meetings; it gave us all a chance to show them around the city. We finally visited the Dominica Museum, which conveniently was only steps from the hotel. Pretty much single-handedly maintained by one man, Lennox Honychurch, who is the foremost historian of the island, it had quite an interesting collection of photographs, archaeological finds, and cultural displays. Once one of the finest gardens in the Caribbean, Dominica Botanical Gardens was the victim of bad timing. In August 1979, the entire island was devastated by Hurricane David and because they had gained independence from England only a few months before, no help was forthcoming. Although the gardens have never recovered their former glory, they are still beautiful and definitely worth a visit. Open: 6:00 am – 7:00 pm, free admission. This African Baobab tree, nicknamed “Goliath,” was felled by Hurricane David. It landed on a school bus which, thankfully. was empty at the time. The islanders are very family-oriented so few shops or restaurants are open in the evening. Dan and I tried Roseau's KFC on Friday night and were not impressed at all. We discovered they don't have combo meals, everything is a la carte and they don't know what a “free drink refill” is. Maybe that American concept doesn't work here. Sundays are particularly difficult and you most likely will have to eat in a hotel restaurant, as we did. At the Fort Young, fish sticks are made by the chef, not Mrs. Paul. These were made from fresh tuna. Sleepy little Roseau comes alive whenever a cruise ship comes in. Two ships arrived the week we were there. Our hotel windows overlooked where the ships dock so we had a chance to watch everyone set up their booths for the tourists. Drummer/musician setting up his American flag before the cruise ship arrives. We didn't enjoy our walks as much on cruise days. Shopkeepers who normally let us look around in peace became fiercely competitive to get the dollars they assumed we wanted to spend. It seemed like every guide on the bay front offered us a tour, too, and some of them were quite intriguing. Had we been in the market, we'd have had a hard time choosing which one to take. Still, the cruise industry is vital to Dominica's well being. If it doesn't get income from tourism or other new enterprises, Dominica may someday be forced to find its income elsewhere, perhaps building the Chavez refinery it has been resisting. It would be a shame if this island had to sacrifice its greatest resource – its natural beauty – in order to survive. View our Dominica photo gallery for more of this beautiful island. Great post it it so rare to see a post on Dominica which is just the most beautiful island I think in the Caribbean. I lived on Antigua for many years and we often visited this island to relax, check out the waterfalls and admire the flowers. Thanks for the reminders. Your post reminded me about a trip we took many years ago to Rosarito, a small town in Mexico: hot like hell and no air conditioning. The best inn in town had a couple of rooms with fans though. But it that kind of heat they weren’t helping much. Unlike you however we weren’t stuck there, so after a day we ran out of there as fast as we could. You seem to have coped pretty well with Roseau, considering the amount of time you had to spend there. I think you were very inventive. Thanks, Anda. Smoothie Man really helped us cope.